Pack your healthy, homemade lunches in this stylish, reusable plastic to-go bowl that protects and serves. It's time for the brown bag lunch to get an upgrade. 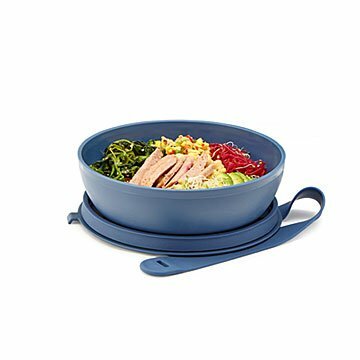 Unlike many lunch totes, this grown-up to-go container starts with an elegant bowl that's large enough to hold a full meal. Made of BPA-free plastic, it's tucked into a soft, silicone wrap with a built-in, airtight lid. Fill it with a salad, grain bowl, or leftovers, pop it into your work bag, and you'll be ready to refuel when your engine runs low. It's reusable, easy to clean, and doesn't generate trash like lunch sacks or sandwich baggies. Designed in Brooklyn. Made in China. Looking for some inspiring flavors now that you have the perfect way to pack them? The cookbook Lunch! is sure to hit the spot.